Image by mathoov via FlickrI followed the Apple keynotes yesterday via a stream directly from the event and through the roars of applause, the loud pounding on the keypad of the blogger reporting developments and the occasional laughter there were the expected big announcements. The interest in this event was obviously going to be overwhelming for site infrastructures as so many couldn't handle the traffic peak and struggled to keep up. I was interested to see how Twitter and FriendFeed would hold up to what can only be compared to a tidal wave of geeks searching for the best source. Twitter as I wrote about yesterday was struggling to handle the activity but it managed to stay up which I think surprised a lot of people. FriendFeed on the other hand was really stable and provided all the action, MG Siegler had set up the VentureBeat WWDC room and was live blogging the news and it held up and every point made generated discussion. Also Robert Scoble was reporting from the SF Apple Store, his take was that everyone else would be reporting from the WWDC and he couldn't compete with sites like Engadget and Techchrunch so wanted to get reaction. He said journalism has taught him to go where the crowds aren't to find the news and that impressed me. Needless to say where ever people were they were all checking in on FriendFeed to see what people were saying! After 250,000 downloaded SDKs, 25,000 official beta developers applicants (only 4,000 accepted), the Application Store is finally coming in July. And it's going to be full of applications. • Super Monkey Ball. Ethan Einhorn from Sega presented the game. The gameplay is very smooth, and they developed 110 stages in just 8 weeks after their original announcement. Now it is available for $9.99. • eBay has also developed a dedicated auction application for the iPhone—available from the store for free—not a Web app, but the real thing. • Loopt, a dedicated application that uses CoreLocation services to find people near you. • A dedicated TypePad client will also available for free, with some really cool stuff. • The Associated Press is also delivering a news channel, a dedicated app for the iPhone that can handle photos, news, and video from their network, as well as giving you a way to send them tips. • Enigmo, one of the two games from Pangea, they have ported from Mac OS X. Also $9.99, like Super Monkey Ball. • Cro-Mag Rally is the other game, which took them three days to move to the iPhone in rough form. It uses the accelerometer to drive, turning the iPhone around. Like Enigmo, is $9.99. • Mark Terry, an independent developer from England, showed Mow Cow, a cool music application which allows you to basically have a band in your pocket. A beautiful application. • Major League Baseball also showed a dedicated baseball application, capable of showing stats, results, and video. Looks amazing too. • Modality is a medical-oriented application, which allows you to see anatomical images and really zoom in. • MIMvista, another medical-oriented application which allows access to scans and reports in real time over the air. • Xavier Carrillo Costa, from Digital Legends Entertainment, presented a God of War-like game, with dramatic images and graphics. Really stunning. 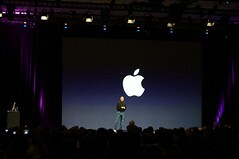 eBay announced and demonstrated its new Auctions app at Apple's Worldwide Developers Conference in San Francisco. Users can log in to their accounts to buy and sell items wherever they are. The app integrates with Webkit, allowing people to write out full descriptions just like they would in Safari, which has been formatted to match the finger-friendly screen. Users can also browse and sort through auction photos the same way they're used to doing with native albums. The rumors were true, Apple just announced their new MobileMe service. Push mail, contacts and calendar data all in the cloud and synced back to your iPhone over the air. Works with the Mac's Mail.app, iCal, and Address Book as well as on PCs for those using Microsoft's Outlook. It's built around Ajax and fully "web 2.0" so that you can access the service from your favorite web browser while maintaining the look and feel of your desktop applications. Syncs photos from your iPhone too. Available at me.com for $99/year and 20GB of on-line storage -- 60 day free trial in early July. Dot mac (.Mac) is gone, baby gone. The iPhone 3G, unveiled by Apple CEO Steve Jobs at the end of his Worldwide Developers Conference keynote Monday, will sell for $199 for the 8GB model and $299 for the 16GB model. That’s a $200 discount from the previous $399 and $499 prices for the 8GB and 16GB iPhones, respectively. And it’s a far cry from the price tag for the iPhone when it was introduced nearly a year ago. Last June, the iPhone cost as much as $599 for an 8GB model. Apple offered a very direct reason for the price cut—it wants to boost sales. According to figures cited by Jobs during his keynote, 56 percent of the customers who haven’t bought an iPhone say they passed on the product because it was too expensive. “We think we can check off ‘more affordable,’” Jobs told keynote attendees Monday, as he rattled off the iPhone 3G’s features. The price of the iPhone itself isn’t the only cost that’s changing, though. While the iPhone 3G requires a 2-year contract with AT&T, just like its predecessor, the new phone’s data plan will be slightly more expensive than the original model’s, running $30 a month for individuals and $45 a month for businesses. Don’t bother watching the 107 minute version of Steve Jobs WWDC Keynote: instead, watch Maholo Daily's 60 second version! !